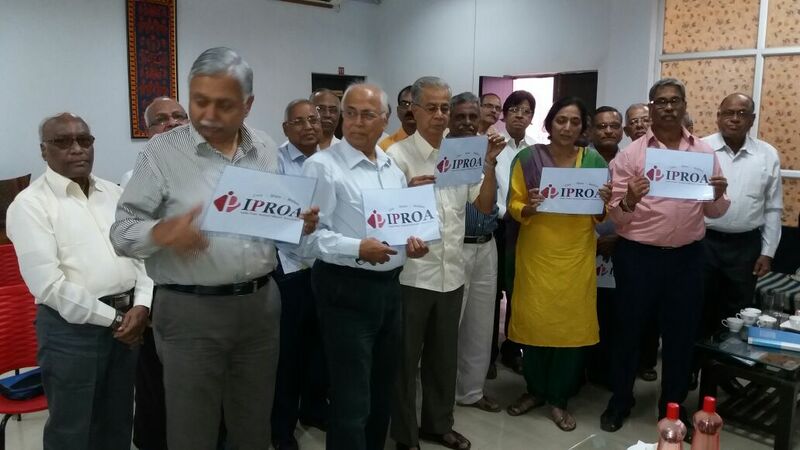 There would be nation wide protests by central government employees starting from July 1 against the HRA recommendations made as per the 7th Pay Commission by the Union Cabinet. The NDA government has once again betrayed all the central government employees said M Krishnan, secretary general of the Confederation national Secretariat. He said that the demand of the employees to restore HRA to 30, 20 & 10% was denied. 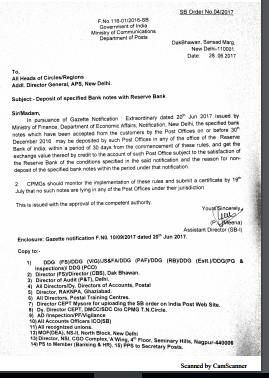 Date of effect for allowances is fixed as 01-07-2017 denying 18 months arrears. 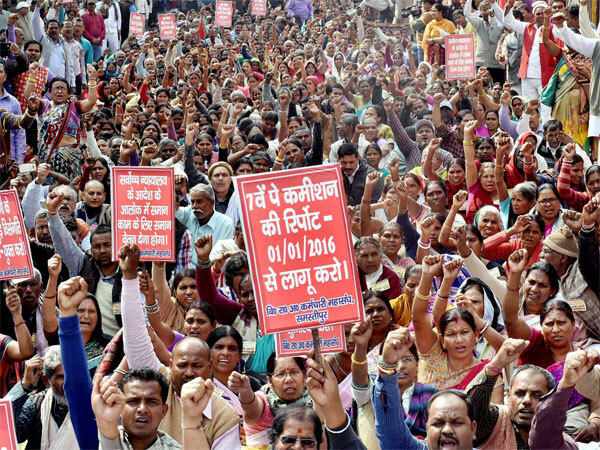 The BJP lead NDA Government deliberately delayed the legitimate right of the employees. 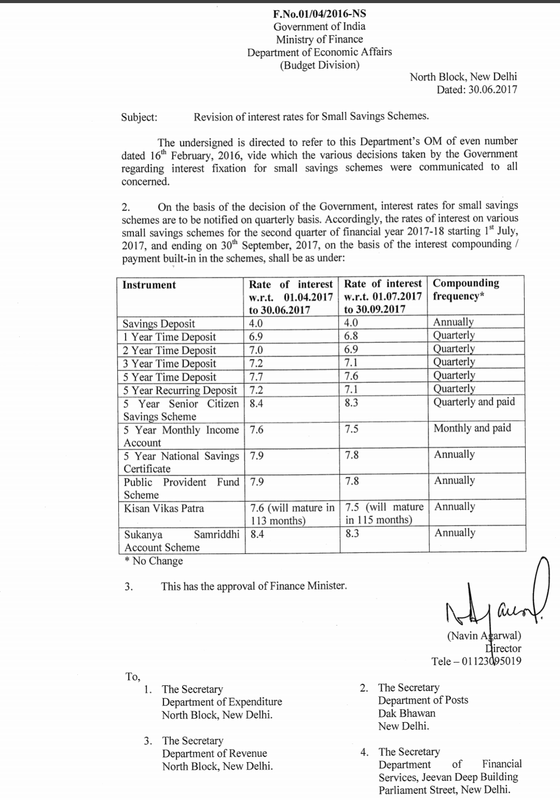 The assurance given by Cabinet Ministers regarding increase in Minimum Pay and Fitment Formula is also not honoured till date. NDA Government is the worst Government as far as employees and workers are concerned, he further added. Confederation National Secretariat calls upon entire Central Govt Employees to hold demonstrations in front of all Central Govt Offices protesting against the anti-employees, anti-workers stand of the NDA Government, a note read. The employees are also unhappy with the date set by the Cabinet for the rollout of allowances. It should have been July 2016. The Cabinet instead went to announce the rollout from July 2017, employees say. After a 12 month wait the government has decided to implement the Allowances without any hike with effect from 1st July 2017 . It is tough decision for us to accept they said. Government Decision on HRA HRA is currently paid at 30% for X (population of 50 lakh & above), 20% for Y (5 to 50 lakh) and 10% for Z (below 5 lakh) category of cities. 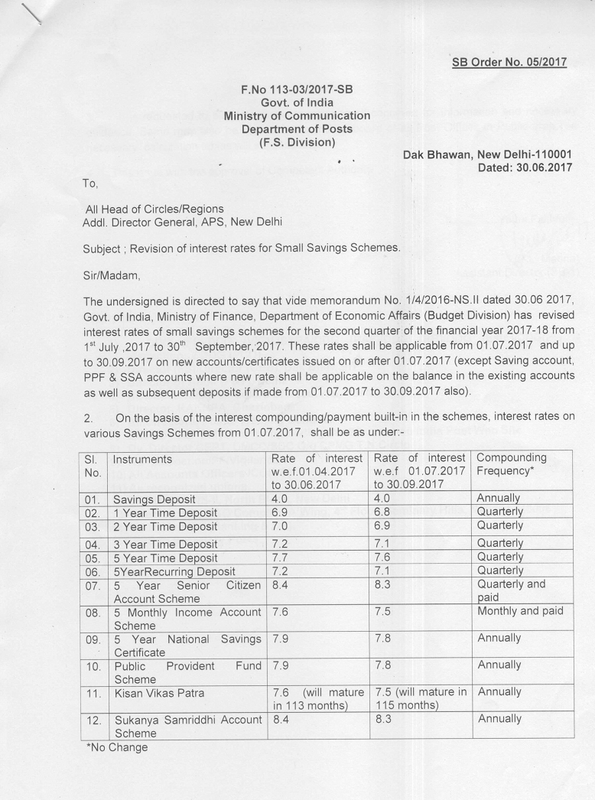 The 7th Pay Commission had recommended reduction in the existing rates to 24% for X, 16% for Y and 8% for Z category of cities. As the HRA at the reduced rates may not be sufficient for employees falling in lower pay bracket, it has been decided that HRA shall not be less than ₹5400, ₹3600 and ₹1800 for X, Y and Z category of cities respectively. This floor rate has been calculated @ 30%, 20% and 10% of the minimum pay of ₹18000. This will benefit more than 7.5 lakh employees belonging to Levels 1 to 3. We are in the process of Preparing Transport Allowance Ready Reckoner to know the amount of TA to be paid in 7th pay Commission. In our previous Post, [ See ]We have brought one issue to the light that the Government Servants placed in Level 1 and Level 2 and Pay in PB equivalent to 7440 and above in Sixth CPC will be getting less amount of Transport Allowance in 7th CPC than 6th CPC. In Sixth CPC those who were in the category of GP below 4200 and Pay band below 7440 were entitled for TA only at the Rate of Rs.600+DA for A1/A cities and Rs.300+DA for other cities. But The sixth CPC had relaxed the condition for this Group to get Transport Allowance at the next higher rate of Rs.1600 for A1/A cities and Rs.800 for other cities. 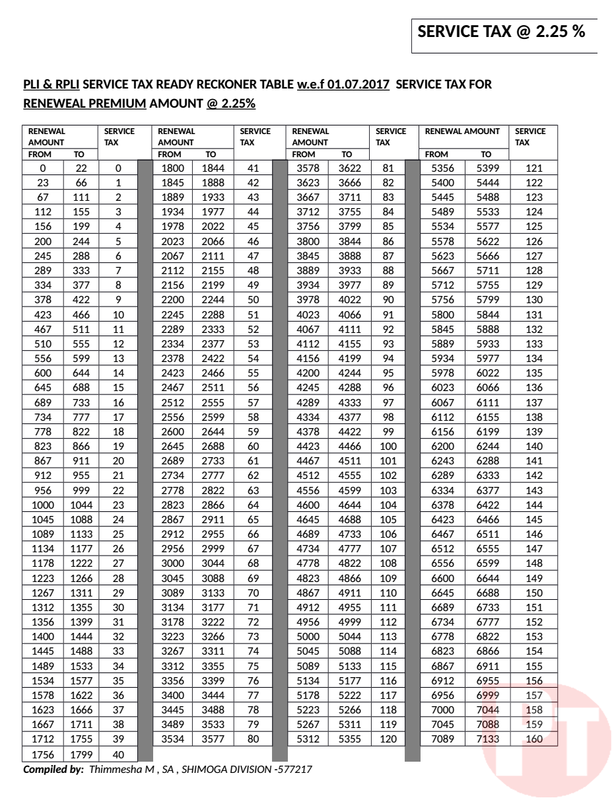 Those who Reached the Rs.7440 PB level and above were entitled for the above-mentioned rates. Now, the 7th CPC might have thought that there is no point in Keeping the GP 2000, GP 2400, GP 2800 Levels at Lower TA rate, as they would become entitled for next higher rate of Transport Allowance at the initial stage itself. So it was a wise decision to bring them into the Group that is eligible for Transport Allowance at the rate of Rs.3600 +DA [Higher TPTA Cities] and Rs.1800+DA [other Places] in 7th CPC. 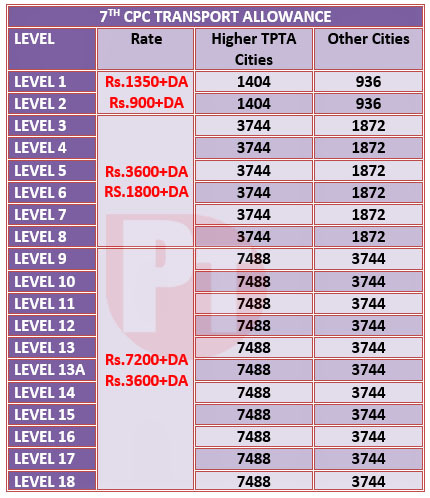 But, though the lowest Two Grade Pay Levels (Pre-Revised Rs.1800 GP and 1900 GP) are made eligible for TA @ Rs.1350+DA [ Higher TPTA Cities] and Rs.900+DA [Other Places] in 7th CPC, there are cases that some Govt Servants those were in 1900 GP and crossed 7440 were drawing TA at the rate of 1600+DA in Sixth CPC. Now they will be entitled for TA at the rate of Rs.1350+DA in Seventh CPC. So it will be useful, if Transport Allowance Ready Reckoner for both Sixth CPC and 7th CPC is available. 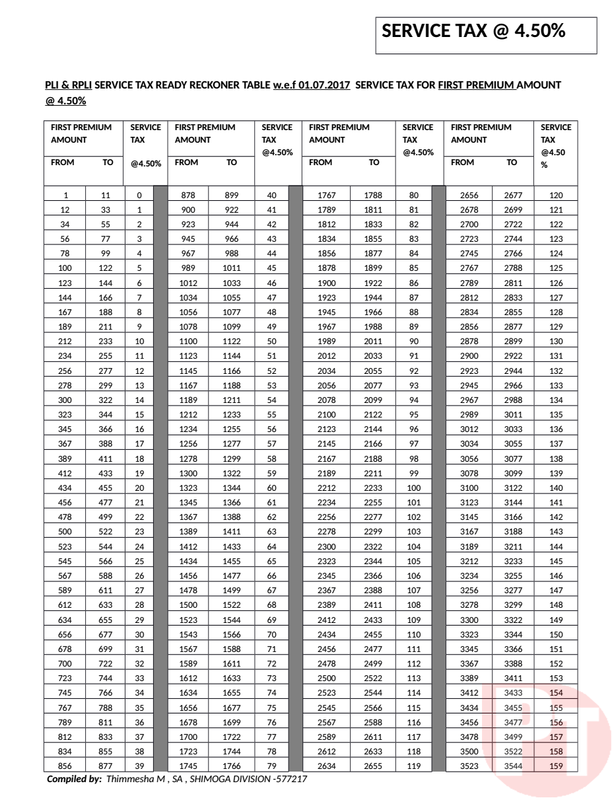 So that we can find the difference between amount of TA in Revised and Pre-Revised Rates. We are currently in the process of finalising Transport Allowance Ready Reckoner. 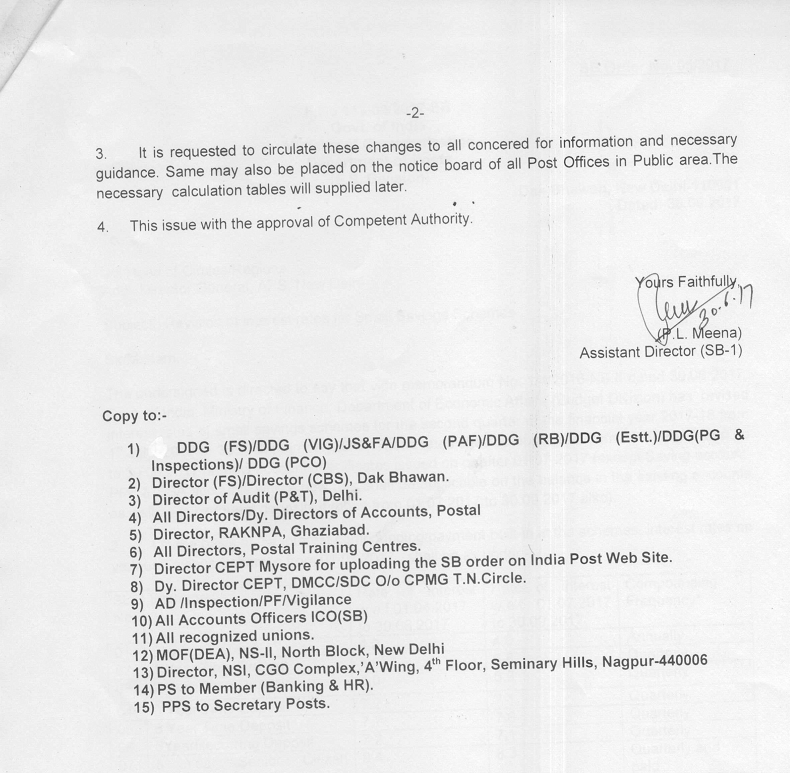 We will publish the 7th CPC TA Ready Reckoner as soon as possible. 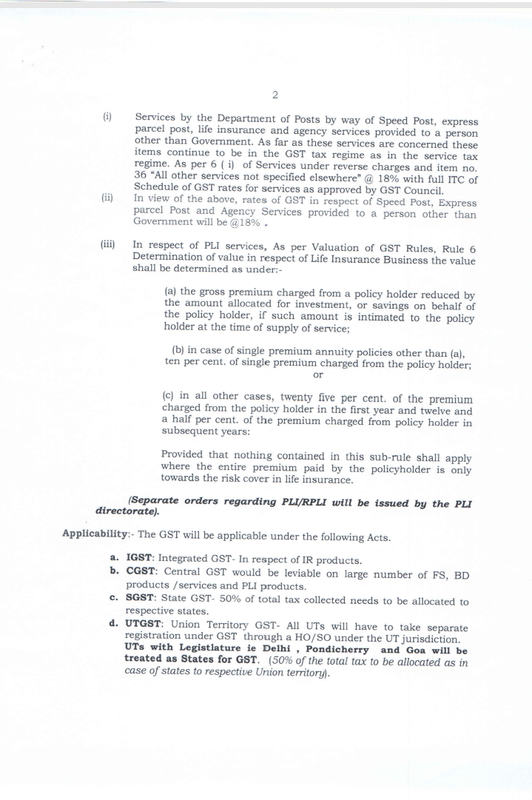 Click below link download Ready reckoner for PLI & RPLI service tax @4.5 and @2.25 in pdf format. Under MGNREGS, April to June, 2017 has seen a significant demand for wage labour specially for water conservation works. Nearly 75 Crore person days of work has already been created and more is expected by 15th July, 2017. This means that nearly 80 lakhs to 1 crore workers are coming everyday for work in different parts of the country under MGNREGS. Over 86% of them are paid within 15 days. This is a remarkable improvement compared to earlier years. 99% payments are on the electronic Financial Management System (e-FMS). The Central Government has ensured timely release of funds and States have responded by strengthening the implementation machinery to provide timely payments. The thrust on agriculture and allied activities, is showing at the field level with 74% expenditure on these works. 2,264 water stressed blocks have received special attention for Natural Resource Management, Water Harvesting and Water Conservation. 2.62 lakh water conservation works have been completed in the Current Financial Year including 1,31,789 Farm Ponds across the country. MGNREGS has created over 91 lakh hectares irrigation potential in the last 2 years which is currently being evaluated by the Institute of Economic Growth (IEG), New Delhi. The report is expected by 30th September, 2017. 1.45 crore assets of MGNREGS have been geo-tagged so far and are in the public domain. 5.2 crore workers are already on the Aadhar-based Payment System (ABPS) and over 9 crore workers have seeded their Aadhar details with consent in NREGA Soft MIS. 87% job cards have been verified and 1.1 crore job cards have been deleted so far after giving reasons. There has been a registration of 89 lakh new job cards to ensure that deprived households get work. 24 States have set up independent Social Audit Units and 3100 State Resource Persons have been trained to conduct social audit as per auditing standards. Large scale training of Self-Help Group women as Village Resource Persons for social audit is being undertaken. 5,245 Bare Foot Technicians (BFT) have been trained so far in 19 States to provide technical support at field level. Stress has been laid on public information and Citizen Information Boards at all work sites is being ensured. Record maintenance has been simplified and over 90% Gram Panchayats have already adopted the simplified seven Registers. Concerted efforts to move MGNREGS workers on the skilling ladder through placement-based wage employment under DDUGKY and self-employment with Bank linkage through Rural Self-Employment Training Institutes (RESTIs) have also been going on effectively across the States. Diversification of livelihoods through women Self-Help Groups is the core thrust of MGNREGS for sustainable economic well-being of the poor households. Take a print out of the check list and fill up response for each action. Ensure that SpeedNet or Speednet Communication is not in use in any system at the time of upgradation. Take full backup of existing databases (i.e., POSPCC and POSPCCBACKUP) before attempting uupgradation. Download the file SpeedOne Updater.exe from the ftp site. Copy the SpeedOne Updater.exe to the Speednet folder in the client system and run it from there. Run the SpeedOne Updater.exe with administrative rights. Watch for successful execution of each script and update the check list simultaneously. Run SpeedNet Communication after upgradation in any one client system so that the database upgradation will not happen repeatedly. This also ensures that version upgradation status messages are created and transmitted to central server for reflection in Speednet MIS. Update Using Script Tool and Replace exe with latest one. 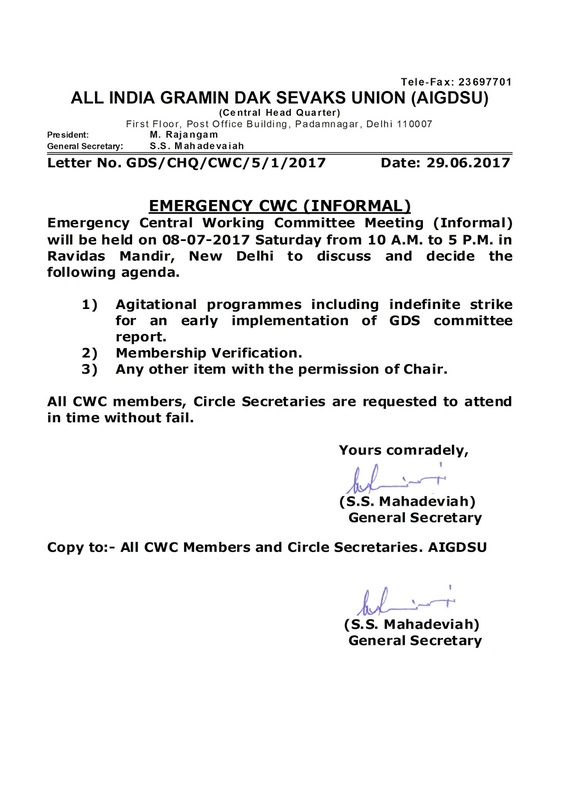 Raise ticket with CEPT HDMS in case of any issues. Please configure the GSTN number of your office, along with office situated in State or Union Territory (based on your circle whether your circle is state or Union Territory) through Supervisor login under MyOffice-->Environment. Configuration of these values is must for working with GST rates. Counter receipts for PLI, RPLI, SpeedPost & Express Parcel are modified in a way that the CGST, SGST & UTGST figures are displayed separately. Provision to capture GSTN of customers for Speedpost & ExpressParcel booking is included. 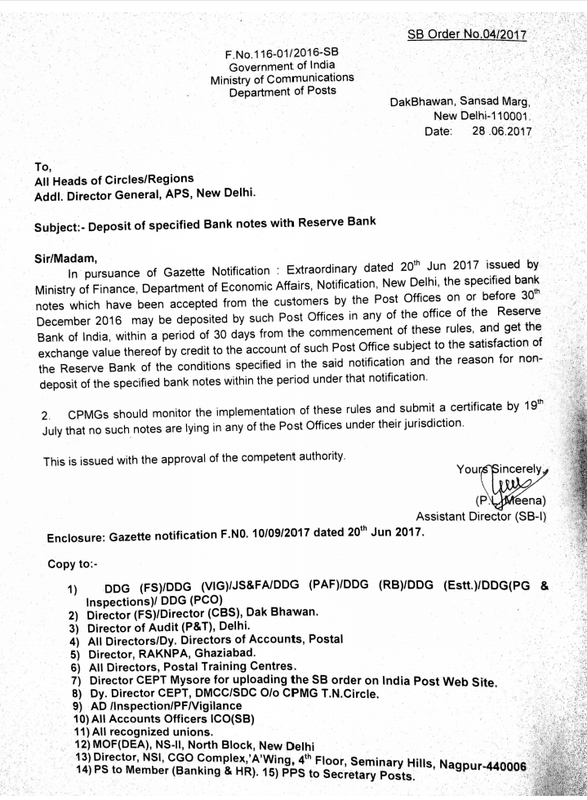 SB Order 4/2017 : Deposit of specified Bank notes with Reserve Bank. 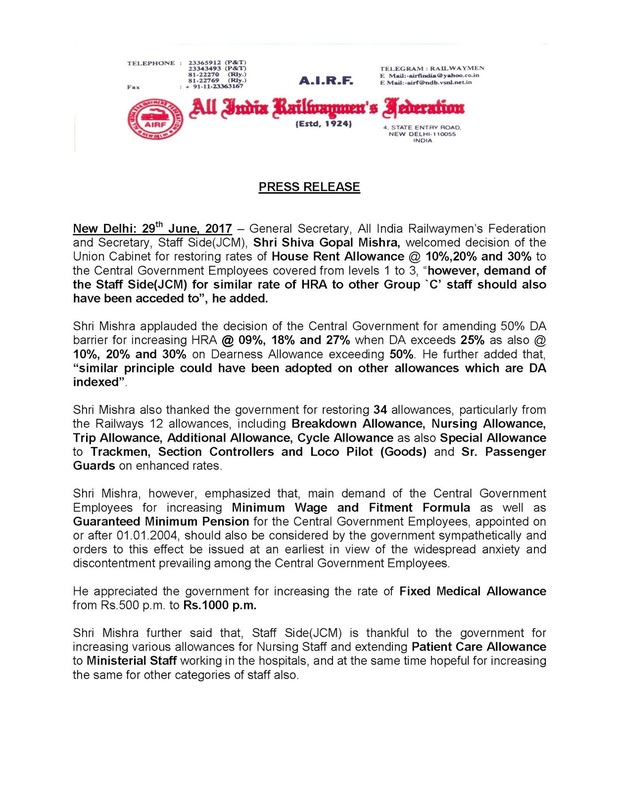 General Secretary, All India Railwaymen’s Federation and Secretary, Staff Side(JCM), Shri Shiva Gopal Mishra, welcomed decision of the Union Cabinet for restoring rates of House Rent Allowance @ 10%,20% and 30% to the Central Government Employees covered from levels 1 to 3, “however, demand of the Staff Side(JCM) for similar rate of HRA to other Group `C’ staff should also have been acceded to”, he added. Shri Mishra applauded the decision of the Central Government for amending 50% DA barrier for increasing HRA @ 09%, 18% and 27% when DA exceeds 25% as also @ 10%, 20% and 30% on Dearness Allowance exceeding 50%. He further added that, “similar principle could have been adopted on other allowances which are DA indexed”. Shri Mishra also thanked the government for restoring 34 allowances, particularly from the Railways 12 allowances, including Breakdown Allowance, Nursing Allowance, Trip Allowance, Additional Allowance, Cycle Allowance as also Special Allowance to Trackmen, Section Controllers and Loco Pilot (Goods) and Sr. Passenger Guards on enhanced rates. 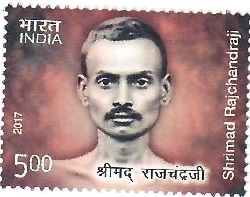 Shri Mishra, however, emphasized that, main demand of the Central Government Employees for increasing Minimum Wage and Fitment Formula as well as Guaranteed Minimum Pension for the Central Government Employees, appointed on or after 01.01.2004, should also be considered by the government sympathetically and orders to this effect be issued at an earliest in view of the widespread anxiety and discontentment prevailing among the Central Government Employees. He appreciated the government for increasing the rate of Fixed Medical Allowance from Rs.500 p.m. to Rs.1000 p.m.
Shri Mishra further said that, Staff Side(JCM) is thankful to the government for increasing various allowances for Nursing Staff and extending Patient Care Allowance to Ministerial Staff working in the hospitals, and at the same time hopeful for increasing the same for other categories of staff also. 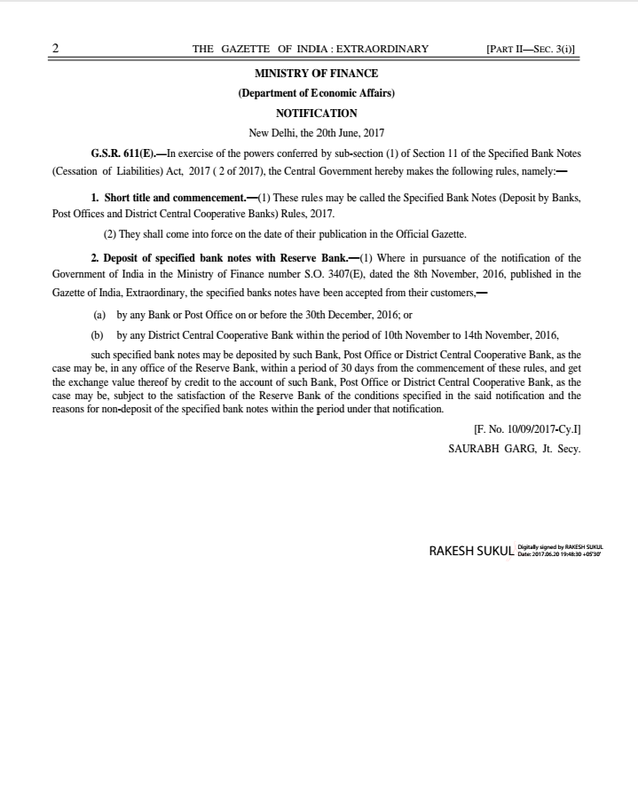 Deposit of Specified Bank Notes with Reserve Bank. It was extremely unfortunate that the Staff Side Secretary through his press statement issued yesterday has chosen to praise the Modi Government over the decisions it had taken on various demands of the Central Govt. employees. The said statement was issued apparently without causing any consultation either formally or informally with the other members of the Staff Side, in any case not at all in consultation with the signatories of this statement. We, being the members of the Standing Committee, emphatically disagree and distance ourselves from the position taken by him in the Press Statement. There had been no justification for the 7th CPC to reduce the rate of HRA by an imagined factor of 0.8. Neither during the discussions, the staff side had with the committee headed by the Expenditure Secretary, nor in the press release issued after the Cabinet meeting, the Govt. had advanced any logic for their decision to restore the rate of HRA only for those who draw pay at the level of Rs.18000. There had been no appreciation of any of the concerns or issues raised by the staff side and whatever decisions so far taken by the Govt. was inconsonance with the views and recommendations of the top echelons of the bureaucracy, be in the matter of allowances, minimum wage, fitment factor, rejection of option no.1 for the pensioners or withdrawal of NPS. There is no justification, whatsoever, for denial of arrears of HRA with effect from 01.01.2016. 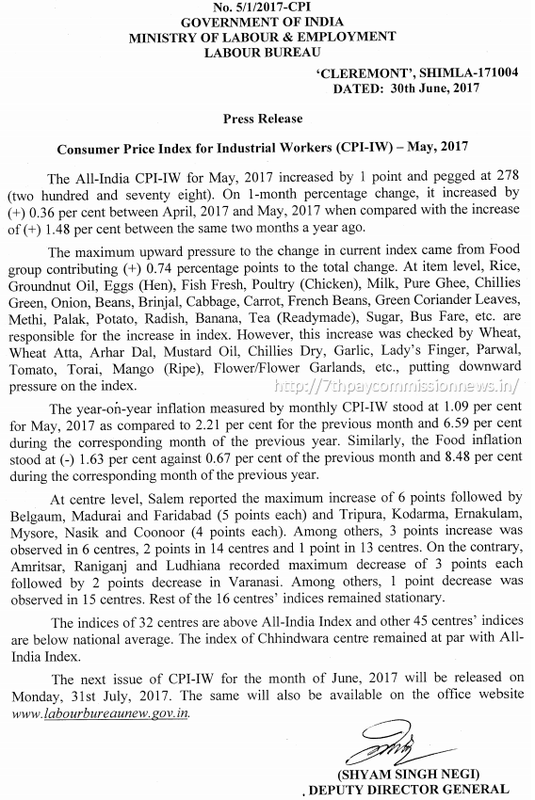 The highly defective computation of minimum wage by the 7th CPC and the consequent denial of a reasonable wage structure, withdrawal of existing allowances and benefits, virtual abrogation of the time bound promotion to the lower category of employees; rejection of option No. 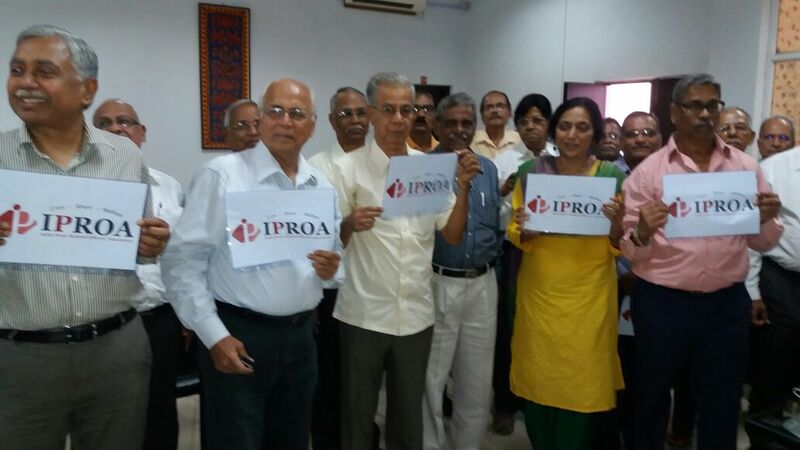 1 to pensioners, refusal to grant atleast a minimum guaranteed pension under NPS, denial of arrears of HRA from 01.01.2016 require the strongest condemnation. The fact that decisions taken by the Govt. on 7th CPC issues are clear reflections of Modi Government's. anti- labour attitude ought to have been, what the staff side secretary conveyed through his press release. His statement has, as stated earlier sadly reflects the total disconnect between the common Central Govt. employees and JCM staff side leadership. Had it been the statement on behalf of the AIRF, we would not have issued this denouncement at all, as we consider that it is the prerogative of each organisation to view things in their perspective and formulate their opinions. 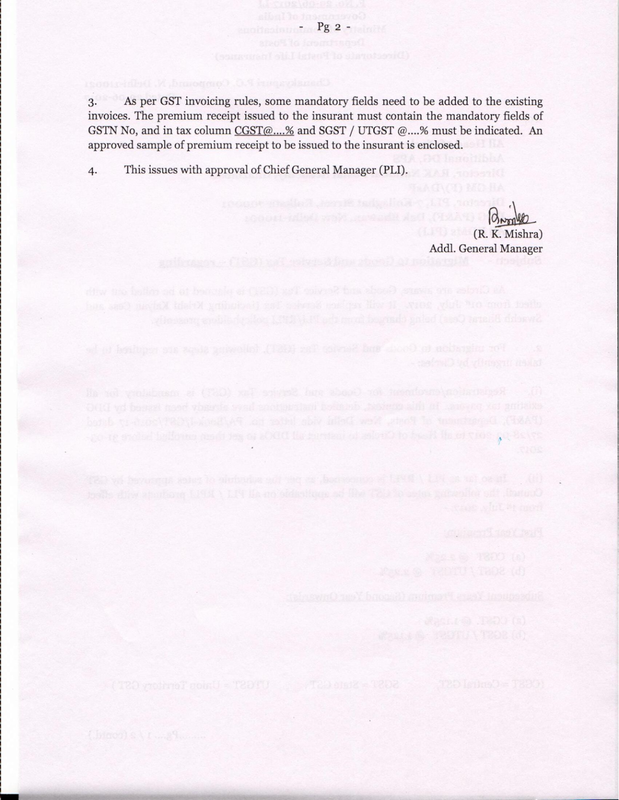 Com Shiv Gopal Misra, Secretary, Staff Side, National Council JCM & General Secretary, All India Railway Men's Federation has issued a Press statement "welcoming and thanking " the decision of the Central Government regarding implementation of the revised allowances to Central Government employees . The statement has created an impression among some section of employees that all the organisations of National Council JCM (including organisations affiliated to Confederation of Central Government Employees & Workers) are of the same opinion and all the leaders of the JCM Staff Side has cheated the employees. To put the records straight, Confederation National Secretariat like to make it clear that our opinion was not sought by Secretary, Staff Side, National Council JCM, before issuing such a statement. We have already given a call to the employees to hold nationwide protest demonstrations against betrayal of the NDA Government. 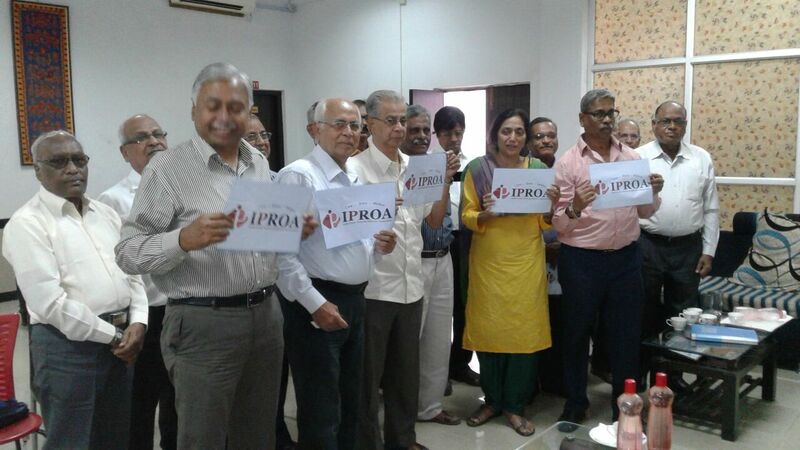 Confederation alone has conducted a series of agitational programmes against the negative attitude of the NDA Govt. towards Employees and Pensioners, including 15th December 2016 Parliament March, 16th March 2017 one day strike , 23rd May 2017 Mass dharna in front of Finance Ministers office , 22nd June 2017 Human Chain etc. Confederation National Secretariat strongly disagree with certain views and comments made by Secretary, Staff Side, and organisations affiliated to Confederation who have representation in JCM totally disown the statement. We strongly condemn the unilateral attitude of Secretary, Staff Side, National Council JCM. The statement issued by the three Standing Committee Members of Staff Side National Council JCM who are representing Confederation in the JCM Standing Committee is furnished below. Migration to GST - Invoicing procedures , Tax rates and changes in software -reg : DoP Order. 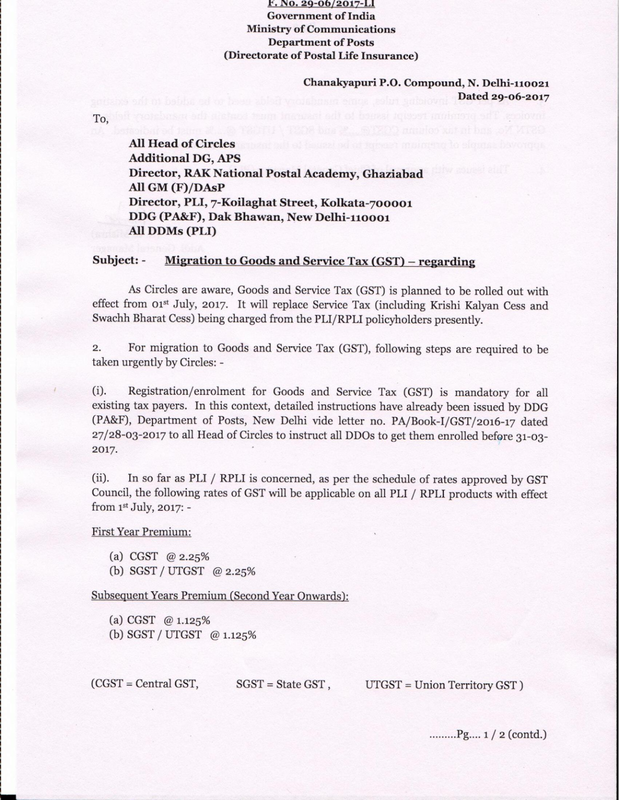 Know all about Goods and Services Tax in India. Its Impact on Indian Economy. New Delhi, Jun 29: GST acronym for Goods and Services Tax which will be launched tomorrow midnight at the Central Hall of Parliament. GST implementation will be the turning point in the Indian Economy since many decades. This is the tax which is basically similar to the Value added Tax. It will unify all other taxes that were levied earlier by integrating into single tax named Goods and Services Tax. The mega Rehearsal for GST Launch was planned and supervised by Mr Ananth Kumar, Parliamentary Affairs Ministers and Team on Wednesday to make the event of GST Launch successful. The leading personalities including President of India Mr Pranab Mukherjee, Prime Minister of India Mr Narendra Modi, Finance Minister of the country Mr Arun Jaitely including senior ministers and bureaucrats of the India. Through the implementation of GST, Government of India want to bring the transparency in the Indian Tax Culture. For making the people understand about the true definition of Goods and Services Tax, our team has prepared some points on GST that will enable them to know what exactly GST is. Lets discuss it through the below mentioned points. Related News: GST Impact: 1 lakh jobs opening in Taxation, Data Analysis, Accounting soon, suggest reports. Which all taxes would GST Replace? What is the Four Slab Structure of GST? As per guidelines issued by GST council, GST will be a four-tier tax structure of 5%, 12%, 18% and 28%. Lower rates will be applicable on essential items and highest rates are fixed for luxurious goods and tobacco, pan masala and aerated drinks. Necessary food items like rice will be taxed at zero rates. However, Service Tax will increase to 18% from existing 15%. What do you mean by Destination based tax? GST is also known as destination based tax. It includes Inter-state supplies, i.e. 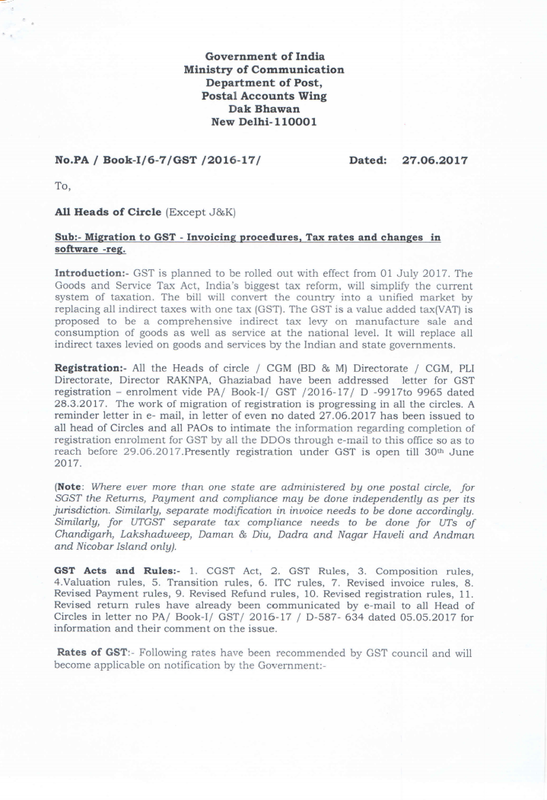 those occurring within India have to compulsorily register themselves for GST. Intra-state supplies, i.e. those occurring outside India, may not attract GST but will certainly attract Central and State levy, namely CGST and SGST respectively. How will GST be Levied? GST will be levied on point of supply only. Supply, as defined by the GST Act, is the sale of goods and services. Supply can take place even without actually selling the product, such as transfer, exchange or rent. 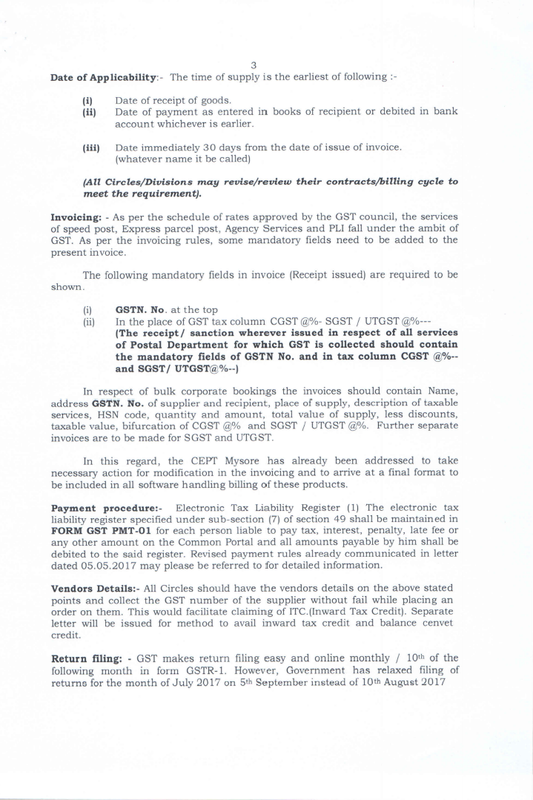 So if a business is engaged in the supply of product or service, they will be mandated to pay GST. It is Single Tax for Whole Country: Goods and Services Tax will integrate all the taxes, collectively into a single tax across all states. 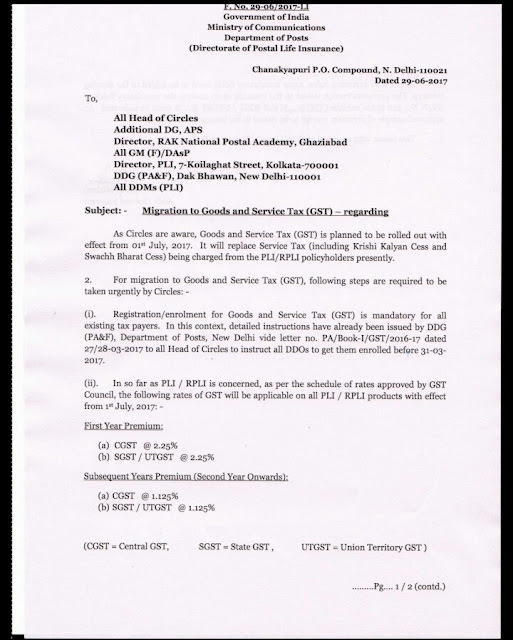 CGST – Central Goods and Services Tax will comprise of Central Taxes such as Central Excise Duty, Service Tax, Customs Duty etc. SGST – State Goods and Services Tax will consist of State levies such as sales tax, luxury tax, VAT etc. 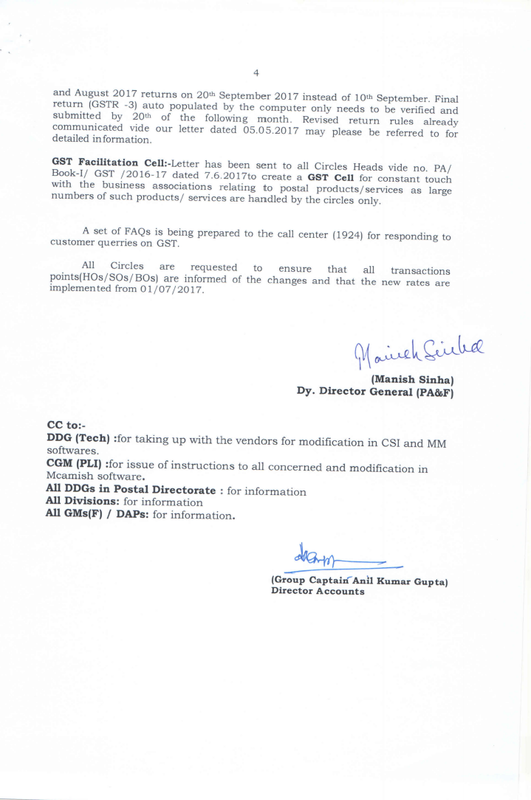 CGST will be levied by the Centre and SGST will be levied by States respectively. What would be the Short term impact of implementation of GST on the current economy and household expenses? In the short run, inflation is likely to increase. With 5-18% taxes on basic services like entertainment and restaurants, prices of movie tickets are bound to increase. Also, a major source of revenue for the government, liquor, and petroleum are excluded from the ambit of GST which will further cause a fiscal deficit. Is GST Beneficial to Consumers? Most consumers are not aware of the plethora of taxes that they pay. Starting from manufacture to the sale of goods and services, consumers are liable to pay tax over tax. GST will bring a transparent tax structure, letting the consumers know the taxes that they pay at each stage. It will also eliminate multitude taxes, making certain items cheaper while increasing the cost of others. Which Items would become costly with the implementation of GST? Cigarettes, Commercial vehicles like trucks, Cell phones and Jewellery would actually become costlier with the implementation of GST tomorrow. The present slabs of tax would be shifted to a higher tax slab from the present one. Which Items would become cheaper with the implementation of GST? What would be the impact of GST Implementation on industry? Ease of doing business in India will improve. A transparency in the taxation system will reduce hidden costs of doing business. Besides, registration and payment will become online for the taxpayers making compliance easy and transparent. Impact on inflation: India will experience a high inflation rate in the initial stages of GST implementation, but in the long run, inflation will be brought under control. Also, it is likely to boost economic growth by 1-2% leading to a win-win situation for all parties involved.